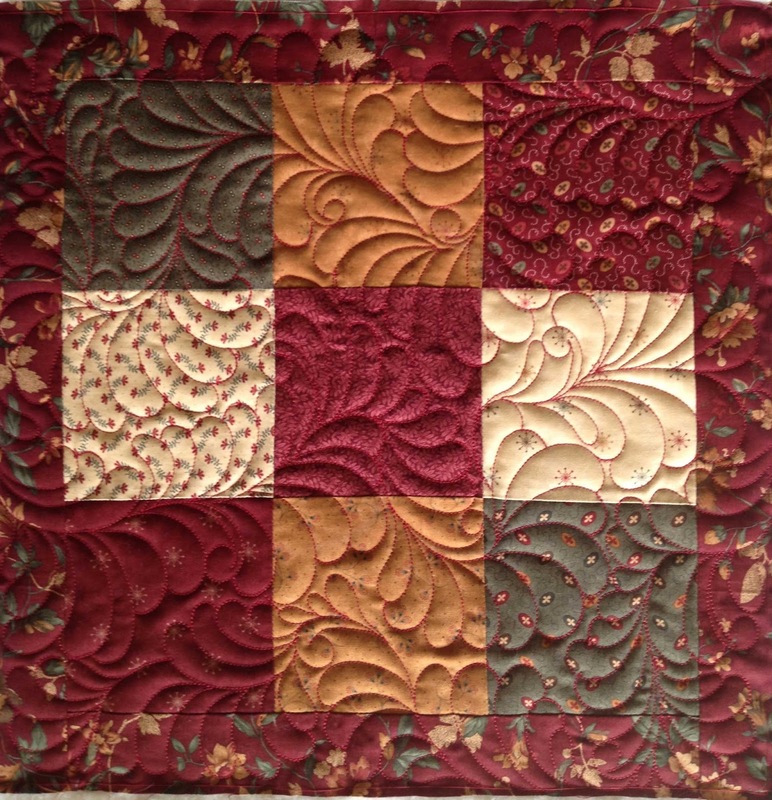 This summer I have been trying to take predominantly simpler and faster quilts from my clients. 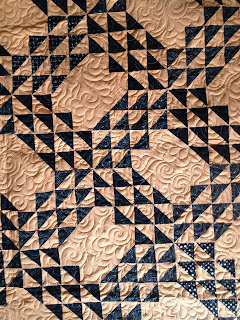 With kids constantly needing things, and no long period of dedicated quilting time, the larger custom quilts are just not realistic to tackle. That said, I am doing a huge custom Civil War quilt in 1 week, but all 3 kiddos will be away that week! 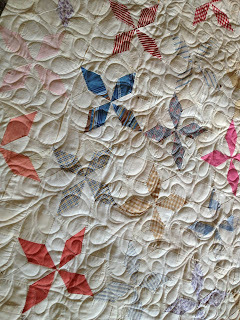 Julie sent me a box of three antique/vintage quilts, each needing an edge to edge quilting. I have two of them here to show. One was just a 9-patch, and other than being made from what appeared to be 70's fabrics, it wasn't particularly old or unique. These are interesting though. 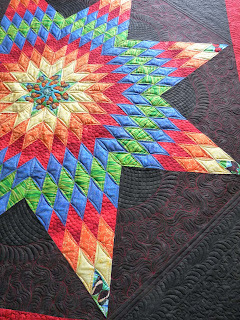 This is a Lemoyne star, hand pieced, and I would date it to the 1920s or 1930s. 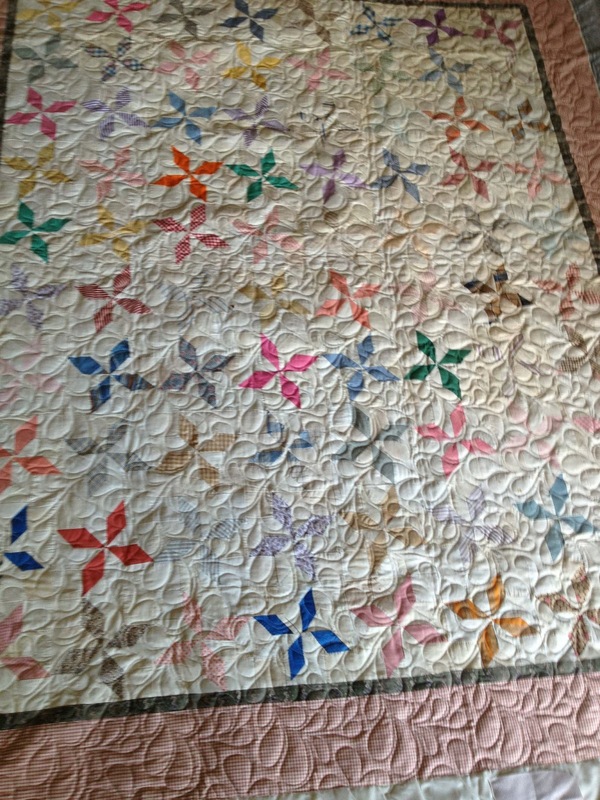 I am by no means an expert on these type quilts, but it is clearly made from clothing and other scraps, and is certainly showing it's age. 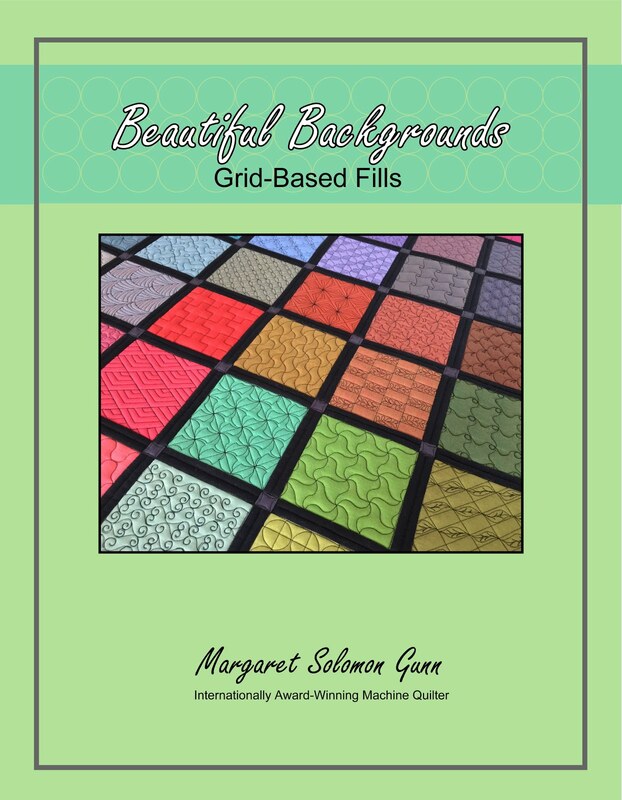 Many of the background fabrics were very thin, almost looking like they were made from a sheer blouse or curtains. 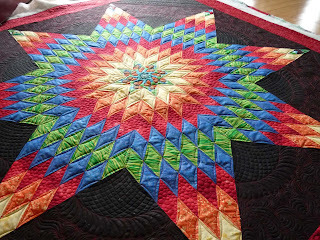 Because of this, I opted to stick a muslin liner beneath the top to even out the colors and the weight of the quilt. We don't want to see the bumps of the batting through the quilt pieces. 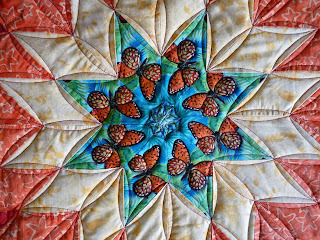 I think that Julie has added the borders on these quilts, but they are in character with the original piecings. I stitched it with the Plumage pantograph. Even if she'd wanted a custom, it really is not a good candidate for custom quilting. 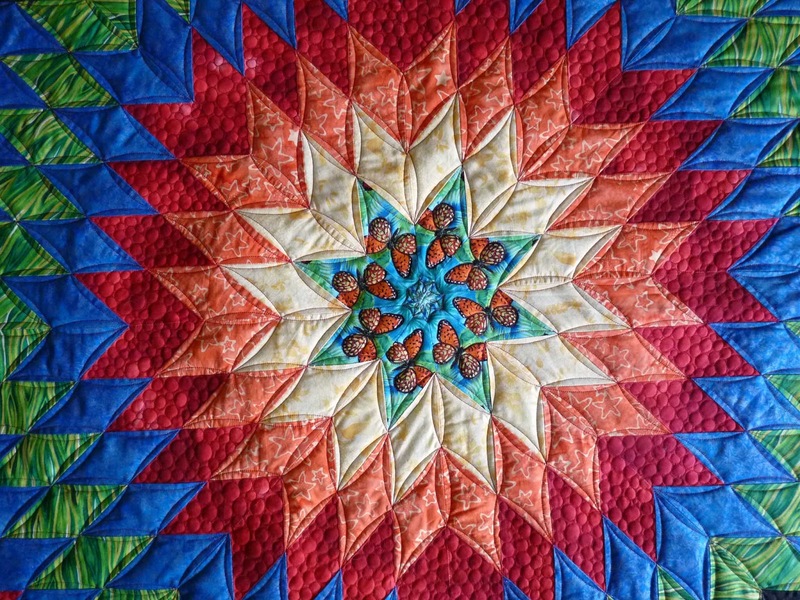 Many of the stars have points tipped off, and because of the overall frailness of the quilt, I didn't want to handle or stitch it any more than necessary. 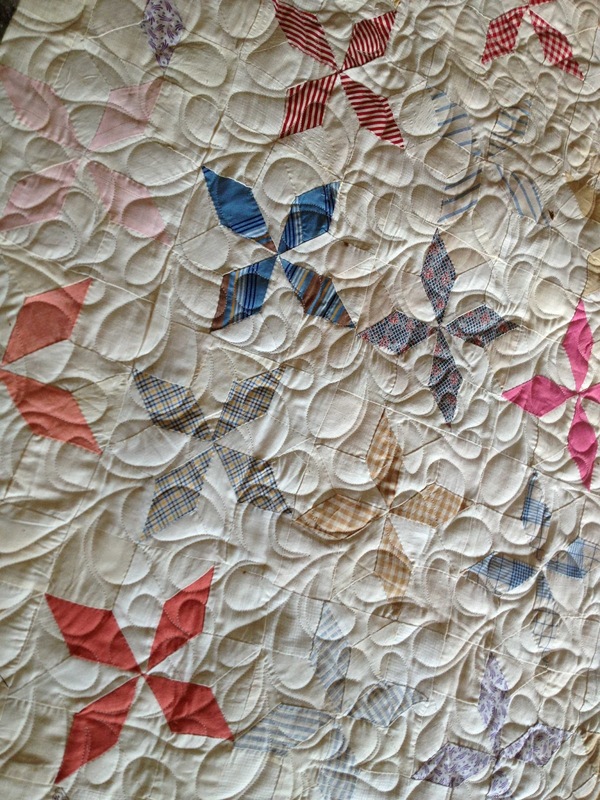 I used my standard Hobbs 80/20 batting on all of these quilts. This one has an ivory Omni thread, which is non-shiny and looks similar to a cotton thread. I like this next one. It's an Ocean Waves pattern variation, which is from the same time period or perhaps a little later. The fact that there is a solid orange fabric makes me question the age just a little bit, but who knows. 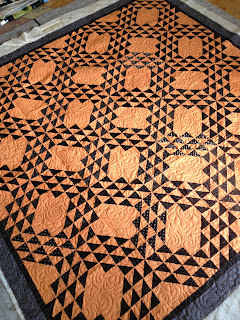 It, too, is hand pieced with a TON of triangles, and borders were added just recently to square up and enlarge the quilt. Now I mentioned in the title of this post that it is about antiques and thread. That does sound a little jumbled and incongruent, but here goes. Before I went on vacation, I conversed with a rep from Aurifil on Facebook, and he said he'd send me some threads to try because I've never used any of their's. Truth be told. I ridded my thread stash of all cottons (what Aurifil is known for) years ago because they are more trouble than the poly threads and they are linty. I was expecting a couple spools of cotton, but upon returning from vacation, I had a box of 11 large cones of Aurifil! There are 2 cones of each weight (12wt, 28wt, 40wt and 50wt) and well as 3 cones of their poly quilter (40wt)! The poly threads are all variegated too. I was blown away by the generosity! So, I decided I'd venture into uncharted territory slowly, trying their poly thread too. It is an orange, gold and pale brown variegated. 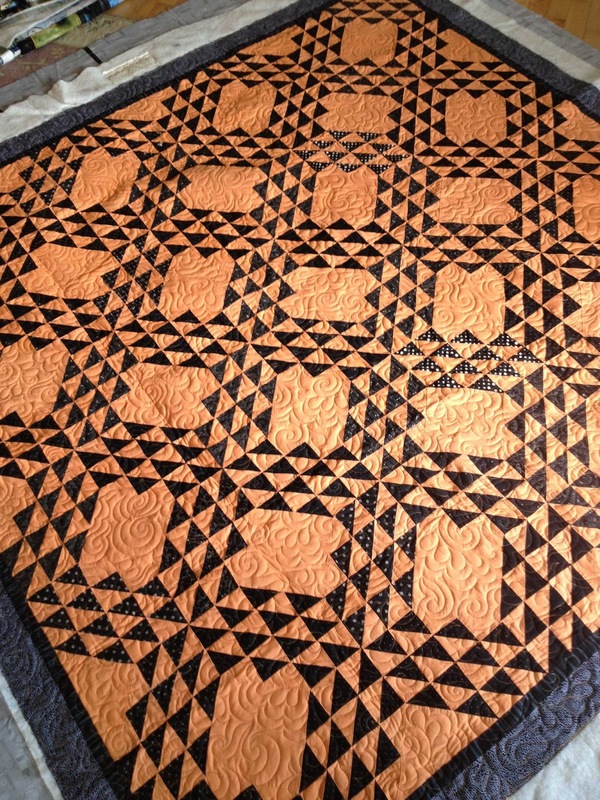 It looks great on this quilt, which is more orange than my photo is showing. This thread is comparable to Glide and Magnifico. 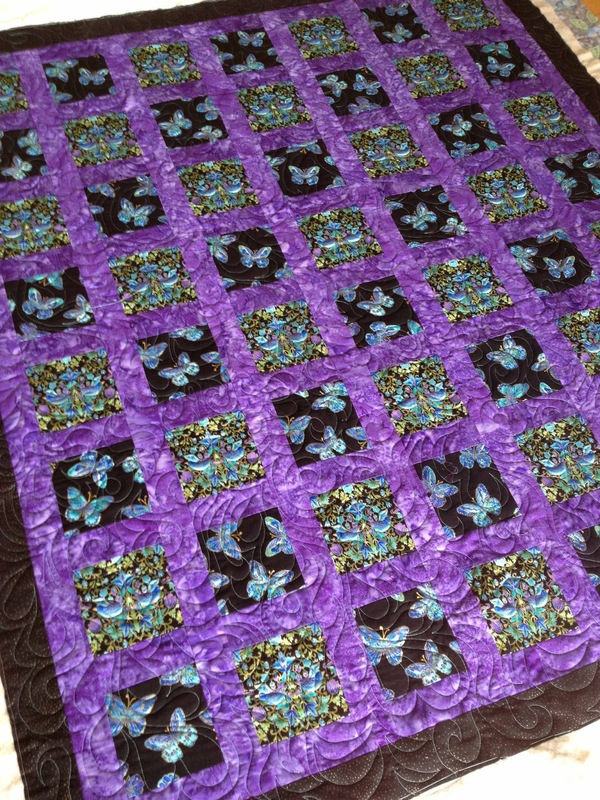 It stitched like a dream, with only one thread break on the entire quilt. Boy to have my hands on another dozen cones of this stuff... :-) The catch is that this is imported from Italy. Quality costs. I looked up a cost of over $30 per cone! yikes...I don't know if they'd have a wholesale rate for me or not, but I will be investigating that. New Thread test #1: Success! 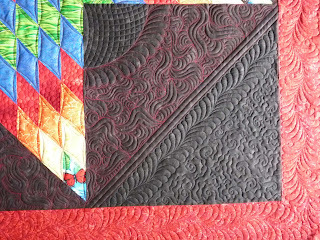 Julie asked for a freehanded swirl/feather/echo pattern I stitch for this quilt. 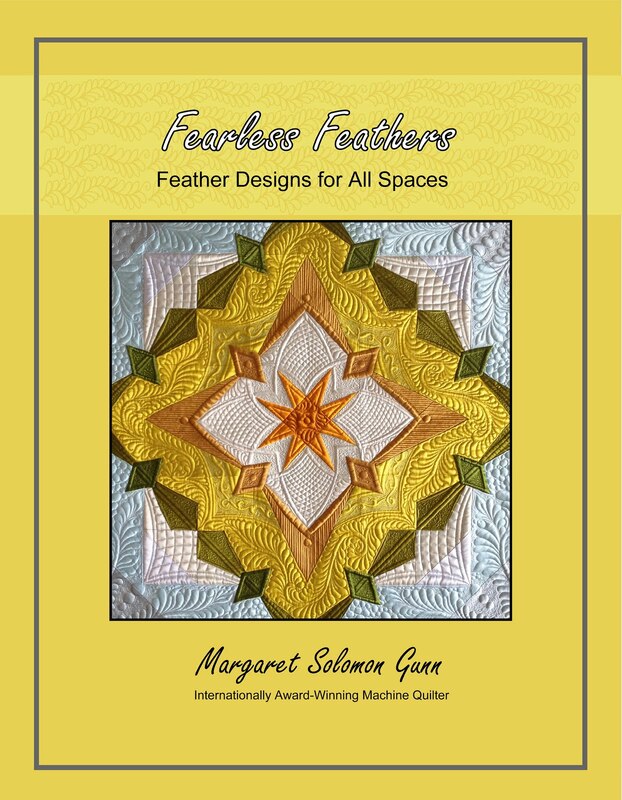 It is not really period to the quilt, but then nothing would be short of conservative feathers or cross-hatching. In the end, it is a little more modernized anyways because of it's color, and the sheen of the thread seems OK on account of that and the pattern selected. 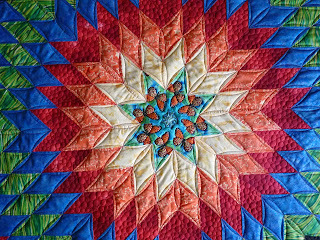 That is all the vintage quilts I have, but I did a couple more quilts this week. This is a local client, Joan. 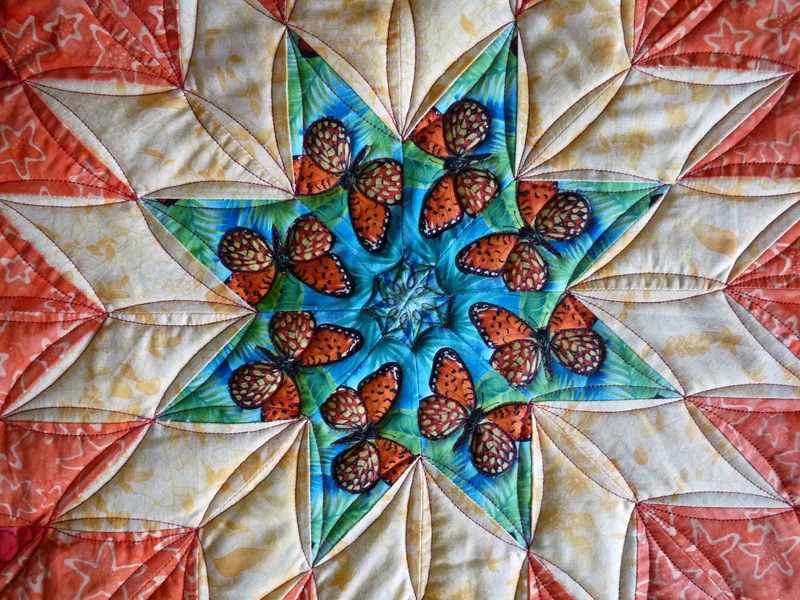 The quilt is simple, yet really pretty. It combines purple batik with a couple prints that I think are Kaufman. They have metallic gold on the. 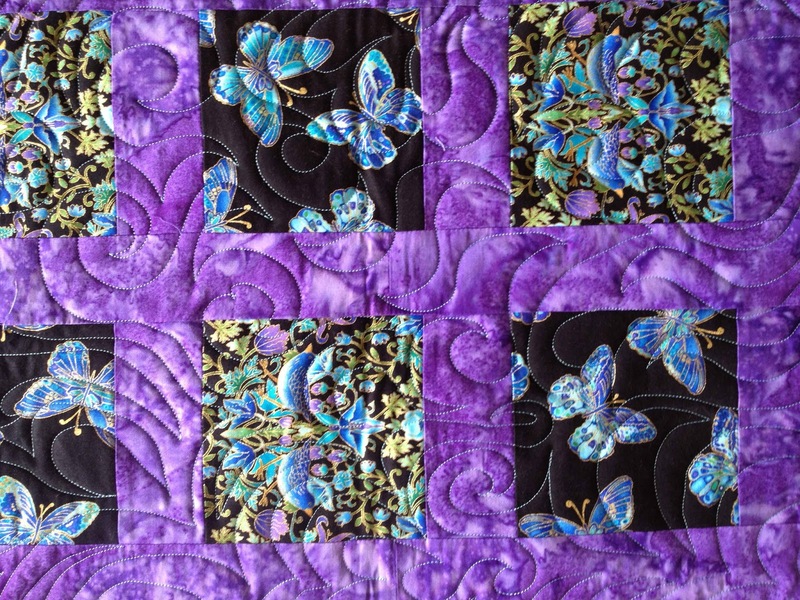 Oddly, the gold Glide thread was overkill on the gold look, and the purple threads I have just disappeared. I went with another new thread that I got free at Paducah. 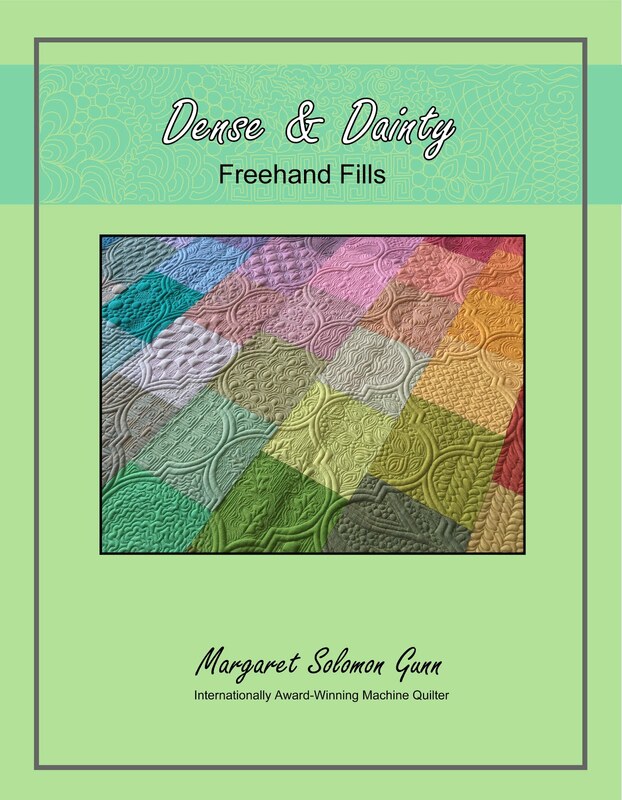 It is a YLI thread - compares nearly identically again to the Glide, Magnifico and now Aurifil too. The prints had soft turquoise on them, and the thread is that very color. I think it was a great choice. This thread also stitched like a dream -- no issues whatsoever. It is very affordable, about $7.75 for 5000yds. I used a Linda Taylor feathery (forgot the name) pantograph. Joan also brought me two 12" (or so) pillows to quilt. 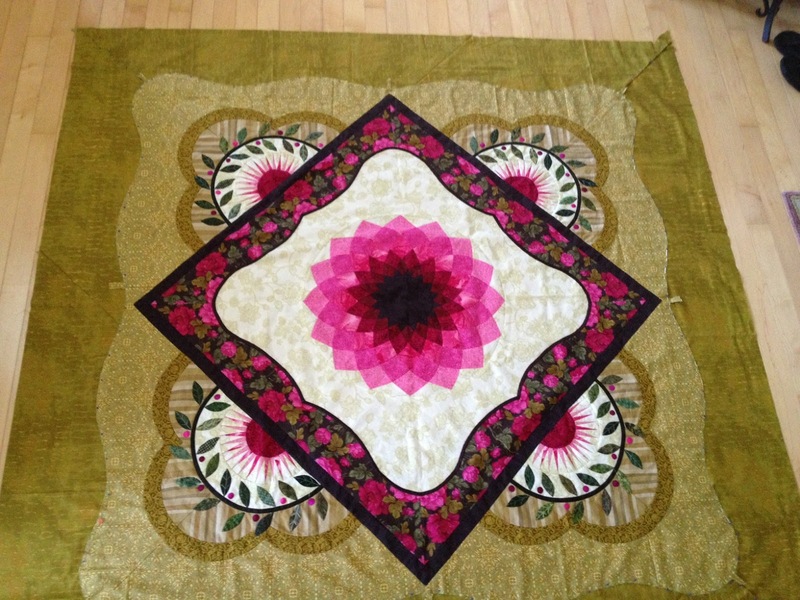 This seemed like the perfect size piece to try out the Aurifil cotton. I realize I really seem like the cotton-phobe here, but I have had bit problems with it in the past that I don't want to repeat. This is a dark cranberry 28wt Mako cotton. It is heavier than the threads I routinely use, but shows really nicely on these shams. It is safe to say that I'd be willing to try the cotton on a larger piece too. Hopefully the thinner weights will run as easily as this one did! 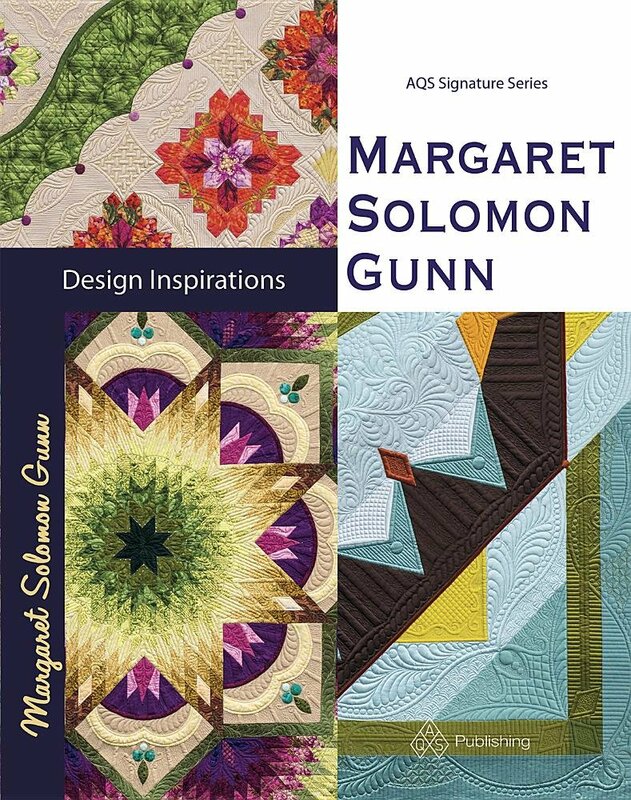 I am off to the Maine Quilt Show this weekend to get a dose of quilting, and to hopefully locate the one elusive fabric I need for the quilt I am currently hand appliquing. 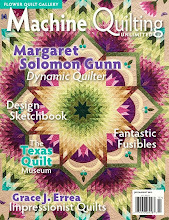 Tune in next week for the show updates (I have quilts at Quilt Odyssey and Maine Quilts both this weekend!). Happy sewing! After the last smocked dress I made for my daughter, I wasn't sure there would be another. Christmas 2011, we/I decided that I'd make her one. When it came time to pick out the fabrics, though, it was a bit more my choice. When it was finished, she decided she really didn't like it, at all! It wasn't worn very many times, despite it taking about 40 hours to make. When she told me she wanted a fancy birthday dress for her 7th birthday, I wasn't at all sure I would make it. But little girls only wear fancy clothes like this for a few years, so off we went a shopping for purple fabric. This is about the brightest fuscia I have seen, but it was her choice. When dresses are smocked, it is best to not have large prints, so I let her use this (all other choices were busier or bolder!). I did most of the smocking on flights to and from Paducah. Remember the air traffic control furloughs in April?...translation: lots of time in airports. When school got out last month, she started giving me the "when you going to finish my dress" comments. I hadn't made this style of dress with the ruffles since she was 3, and the dress had 4 much shorter ruffles on it then! She's still only 46" tall, but this took over 3 yards, not counting the lining. ...and ruffles (especially full ruffles) really swirl out in big circles when toothless girls spin!...We avoid things like pretty bows in the back, since she can't retie them and they are not really comfortable to lean against when sitting. I have used this decorative "belt" on other dresses before, it meets at the zipper with a couple buttons. Basically it is a permanent fixture of the dress. Dress done. 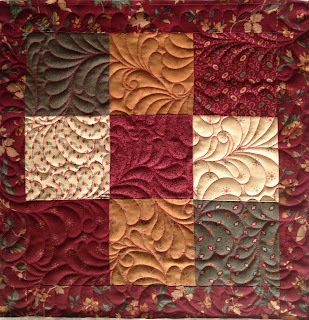 Now onto finishing some of my quilting projects! I feel as though I am at a hump in the summer. It's kind of like reaching Wednesday during a week. We must be about at the halfway point, which is good and not-so-good. Kids don't want to go back to school, but working moms really need them to, if you catch my drift. We got back on Monday from 10 days in Florida. It was easy to just let go and enjoy the break. It's been 3 years since we had been there last. As much as some people dread the heat and humidity of summer, I just absorb it all. The Gulf of Mexico is absolutely glorious. The water is calm and warm and clear. This is our 3rd trip to Anna Maria Island, and I keep finding it a place that is hard to stay away from. I have lived in Florida and traveled to other areas in Florida. Anna Maria is like none of them. It is laid back, barely touristed and just plain relaxing. It's easy to visit beaches that are not swarming with other people. It is true love for a vacation. This trip, we avoided the hustle and bustle and extreme cost of Disney. We chose instead to visit a few attractions in Tampa including the zoo, aquarium, science museum and a water park on the last day. By then we were all ready to go home. 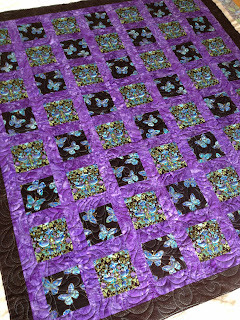 My boys were away to day so I was able to get the curving border trimmed and pinned onto the outer border. 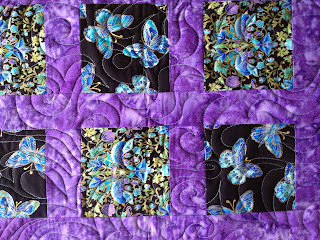 It is getting close to time to pin applique to it! Most of the applique pieces are ready for this process - only some that will be of silk are not prepped yet (am getting the silk next weekend). 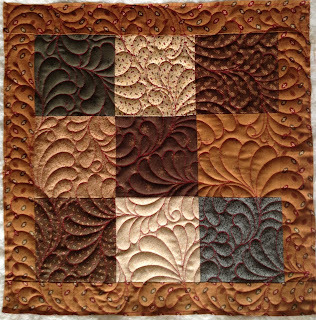 I am blissfully chipping away at some wonderfully simple quilting projects the next couple weeks. 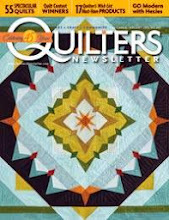 Don't get me wrong -- they are lovely quilts. 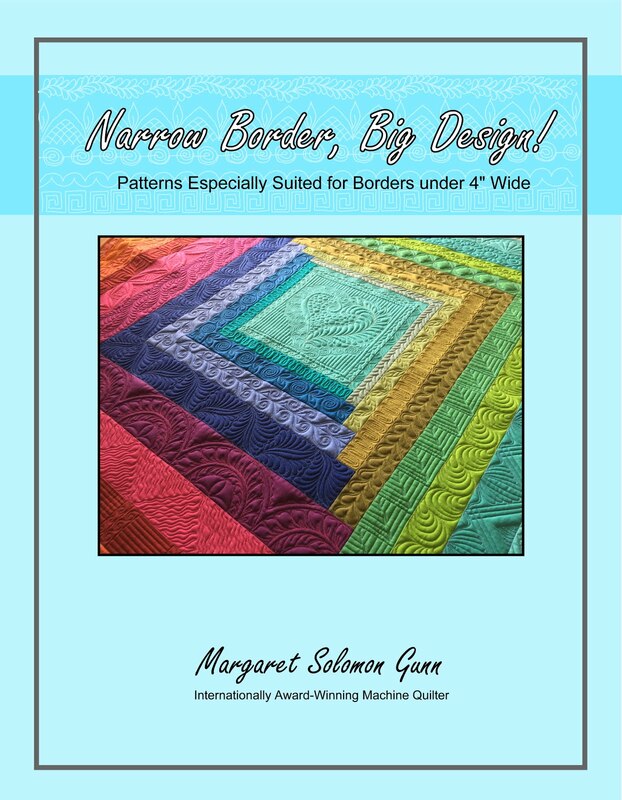 I am just delighted to be doing edge-to-edge quilts for a change. 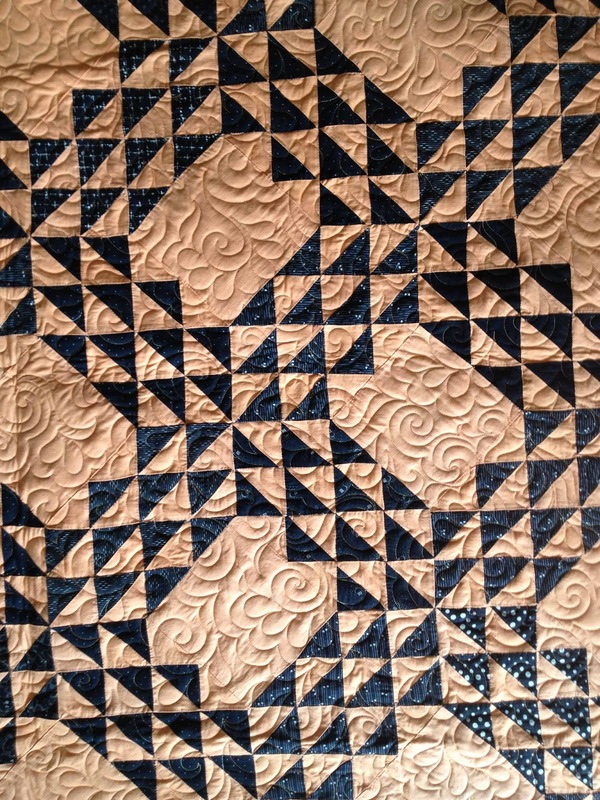 Custom quilting is mind and body stressing. I can't do it all the time. 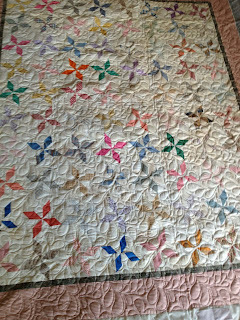 I have some vintage quilts on the docket tight now, and will show them next week I hope. Here is one of my most recent client quilts. 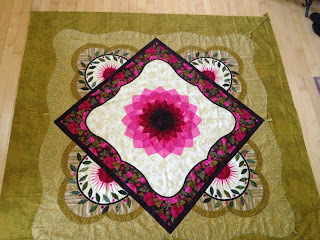 I knew Kari from years ago when I hosted the Four Seasons Quilt Swap and the Spring Fling Round Robin. 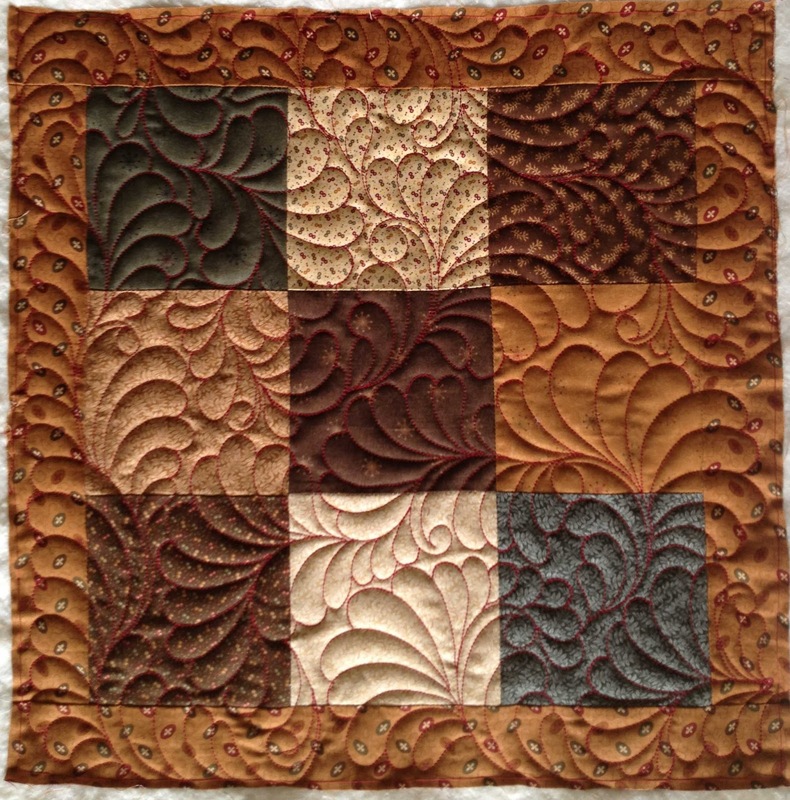 It has been several years, though, since I have done or hosted a swap on account of longarming quilting. Last week when my youngest two kids were at Nana's for 2 days, and my oldest had day camp, I dared to get it out and see if it could be done. A better way to say that is "dare to see if I could be focused enough given that the weather was hot and beautiful to quilt 6 hours a day!". I actually finished it up last weekend, but close enough. 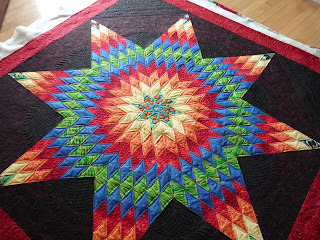 I have a bunch of easier and smaller quilts for this summer, but this one still needed quilting, and I didn't want to leave it for September. about 69" square, single layer Hobbs 80/20 batting. Threads used include red Superior Omni and black Glide. I remember Kari mentioning she thought she wanted some color on the massive black background. I did not want to create this garish background that would compete with the star though. I decided that the red was the dominant color, and went with it. It has color, but it is still subtle. These corners and setting triangles are large areas to fill. I gave them a combination of feathers, cross-hatching (reminiscent of spider webbs, eh?...seemed appropriate with the butterflies) and a couple fillers.You all now how I love the look of cross-hatching! The quilting in body of the star was kept simpler mostly because these diamonds are relatively small, and details won't really show. On the center (below), which has the butterflies, I outlined the butterflies and tacked down the center with a little star. There's gobs of bulk at the center to do too much. It has wonderful texture, and a subtle coloring.